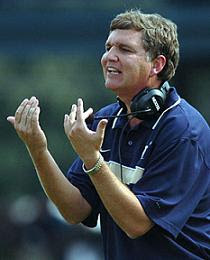 The Navy blog "The Birddog" has a great post breaking down elements of Paul Johnson's flexbone offense. The videos he culls exhibit something I've tried to explain about defending Johnson's offense: you can't just play "assignment football." That term gets thrown around by announcers a lot, with the implication being that all you have to do is "assign" one guy to the dive back, one to the quarterback, and one to the pitch back. The problem is that Johnson will figure out your assignments and change his blocking schemes accordingly. For example, compare the two videos below, again, both courtesy of The Birddog. I'd like to think they got this from me, but all of us like to tout our self-importance, no? HARRY: You hear a lot in the offseason about coaches going to visit different schools and exchanging ideas with other coaches for the sake of the program and professional development. How's that work here? MEYER: "That's a big part of what we do. For example, our strength coach and my administrative assistant, every year -- and they have no choice -- have to get on a plane and go visit the best places in America and find out if we're doing the right stuff. I've always encouraged our trainers, our academic people. It's the ones who sit around and do nothing. At some point, [everybody's] going to catch you. No, that is a must. You are graded on your professional development. That's part of your evaluation. And we don't want to be frivolous. We run a certain style, so we don't want to waste time. Go see your buddy? We don't want to do that. There has to be a reason. [The concept] is kind of amazing. I tell people, I'm sure Pepsi doesn't visit Coca-Cola and figure out how to make pop"
HARRY: Where do you draw the line? MEYER: "It's hard. We've drawn it more. It got out of control a little bit. You have so much work to do. All of a sudden, people are walking in saying, 'Hey coach, you got three hours?' No. You just don't have time. So the last few years we've kind of made it off limits. We do allow some in. If Jon Gruden calls? Absolutely. Bill Belichick comes down every year. We're certainly not going to say no to them. So we handpick who we allow to come in." HARRY: A guy like Gruden, you never know. He could be standing across from you on a sideline one day. MEYER: "True. But you have to get something. This is a two-way street. For Jon Gruden to come in and just take? We're not going to do that. We're not into supplying information. We're into exchanging information. A guy like Bill Belichick? I get 10 times more than what he gets from us. Same for Jon Gruden. . . . I could go on and on and on. [California's] Jeff Tedford. He's one of my great friends. We always do it. Rich Rodriguez? We used to do it all the time [when he was at West Virginia], but now he's at Michigan and a competitor in recruiting so we don't anymore. [Rutgers'] Greg Schiano. I could go on and on. Mike Leach at Texas Tech. We often have conversation. [Utah's] Kyle Willingham and I talk twice a week." HARRY: Give me an example of something Bill Belichick could share with you. MEYER: "Where do I start? I am amazed at the how he handles elite athletes. You never hear about issues with off-the-field stuff. I am amazed to the point that I got on a plane and I went up and watched over three days and saw how he handled these, um, some of these elite guys. For some reason, the Patriots do this, but you hear about the Cowboys and these other teams just falling apart because of chemistry issues. And then there's Bill Belichick. Our whole program is based on what we learned from him; the core of the team has to be strong." HARRY: When was the last time you saw a play or a formation where you went, "Wow! I've never seen that before." MEYER: "Forty-five minutes ago. I've been watching Oklahoma tape all morning." HARRY: Really? You often hear coaches say that nothing is new; that everything has been used before. Yet when the Wildcat showed up in Miami last year, it was like the NFL freaked out. But it was old-time single-wing football, which is lot of what you do here. What was the genesis of your offense? MEYER: Part of it is single wing, yeah. I would say there's a spread element and a single-wing element. We've combined them both. We want to have a run component. At any time, anybody can stop the run. It's just taking one more defender than you can block and putting him right there [on the line]. Unless that guy is not very good and you have a great running back, like a lot of the Big Ten teams when I was growing up. Everybody would say, 'BYOB: Bring Your Own Blocker.' He's on scholarship too, and you have to run him over sometime. That's OK. But to simply say we're going to do that all the time and score points, I can't disagree with that more. So how do you take advantage of the guy that's the extra defender? There's two ways to do it. One: you run a single-wing offense, which means you spread a guy out so that [extra defender] has to go cover him. Two: you spread out and throw the ball. We're going to do both." HARRY: What about the single wing has given it the staying power? HARRY: Option football has universally been written off as something that cannot work in the NFL. There are other offenses people say, flat-out, can't work in the NFL. MEYER: "If you know me, you know I think any offense can work if you have the right personnel back. Offenses are overrated. People are not. The NFL will take a quarterback and put him on a very bad team and call him a bust. Never mind that the defense ranks last in the league and there's no offensive line. Chris Leak [in 2005] had about as bad a three-game [stretch] as we've had at Florida that I've ever had as a coach and it just so happened that Bubba Caldwell broke his leg, Jermaine Cornelius sprained his ankle, Chad Jackson had a bad hamstring and Dallas Baker broke his ribs. And so Chris Leak struggled the next three games when we're playing LSU, Georgia. It doesn't matter what you run. It's personnel based." HARRY: You kind of just told the Alex Smith story. Your guy at Utah. No. 1 overall pick just four years ago. Goes to a bad team. A lot of folks already have written him off as a bust already. MEYER: "I don't want to give you names, but I can list 10 other quarterbacks who aren't doing great, too. They're West Coast [offense] quarterbacks. It's about who's on the team." HARRY: It seems what's happened with Alex is held up as the standard for spread quarterbacks projecting to the NFL. Obviously, you've heard that rap with regard to Tim Tebow's future there, and heading into the draft people were wondering if Percy Harvin's three years of running bubble screens meant he couldn't run a simple dig and the rest of the routes on the passing tree. MEYER: He can run it better than most; and if someone is paying him $20 million, he'll run a great dig route. It's interesting that you say that. I don't hear it a lot, maybe in recruiting once in a while, but I did hear a NFL coach saying something about that. I like to do my homework. I went and checked the record of that coach and the guy barely had a .500 record. [Ed Note: Reminds me of what Mike Leach said about Mangini.] There are certain people I'll have a discussions with. And if I hear something like that, that's not a person I want to have a discussion with. That's nonsense. That's someone putting too much value on scheme rather than personnel." HARRY: Is your offense easy to teach? MEYER: "Again, it's based on people. I keep going back to that, but if you have really good players, it's really easy. If you don't, it's really hard. Is the West Coast offense easy to teach? If Joe Montana is throwing to Jerry Rice, yeah, Daffy Duck can teach it. I don't want to de-value teaching. It's absolutely critical, but I'm still going to go back to personnel." HARRY: Are you a NFL fan? 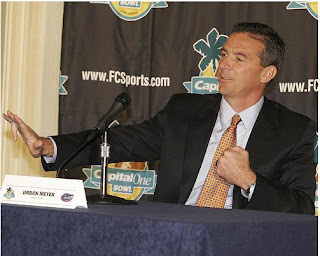 MEYER: "I'm a fan of some players, some coaches, not necessarily teams. I try to watch the Patriots, but Sundays are such a busy day. Maybe on bye weeks." HARRY: But you study some teams during offseason, I'll bet. That constitutes professional development, right? MEYER: "Absolutely. Every year I go to a camp or two. I've already been up to Jacksonville. Spent five hours with Jack Del Rio. Phenomenal coach. I like this new guy [Raheem Morris] in Tampa Bay. I've been invited down there. And I'll get up to New England again." Incidentally, though I generally agree with Dr Saturday that the spread isn't (and need not be) the sine qua non of someone's offense to the exclusion of everything else, practice time must be considered: Division I football teams have a fraction of the practice time allowed in the NFL, but even many high schools have more practice time, counting in summer passing leagues, spring football, and all that. And, with limited practice time, there can be benefits to being a hedgehog like Florida or TTech, and doing one thing extremely well, rather than going for mystical universality by being "pro-style, whereby the players are overloaded. 1. Malzahn follow-on. Lots of follow-ups on the Malzahn post I had last week. Jerry at the Joe Cribbs Car Wash weighs in with his take. Roll Bama Roll takes the slightly more cynical view (not surprising, though check out the comments for some great discussion). Only thing I will say about the Malzahn versus Franklin "we've heard it all before" debate is that all sides now admit that there were serious behind the scenes issues at Auburn last year -- regardless of whoever was at fault -- that would contribute to making any offense dysfunctional. And, of course, Auburn's offense ramained poor even after Franklin left. So continuity and support alone ought to make Auburn's offense at least a little better. Blutarsky feels deja vu but also does a little SEC predictin'. 2. Mike High Report on my post about Brandon Marshall's "trade value." 3. mgoblog in a post that should be titled "How to Blog." 4. TeamSpeedKills on why there is no Platonic Ideal "Urban Meyer offense," and why Meyer is more on the "Just win, baby," side of things. [Kosar] just learned the other day, after much trying and failing, how to make his own coffee. This is a man who owned his own jet and helped found companies, plural. But when his new girlfriend came over recently and found him trying to cook with his daughters, she couldn't believe what was on the kitchen island to cut the French bread. A saw. ''I was 25 and everyone was telling me that I was the smartest; now I'm 45 and realize I'm an idiot,'' he says. "I'm 45 and immature. I don't like being 45." (Ht, again, Dr Saturday.) (Le Batard has kind of a buffoonish persona, but he always seems to snare good quotes from people. Last week he had this colloquoy with Jimmy Johnson: "Will you go days without putting on pants, Jimmy? ''Days?'' he says. ``Weeks! . . . ."
7. The Quad previews the Hawai'i Warriors. My take? They had an identity crisis last year while trying to inject more running into their run and shoot offense. The report is that this year they are getting back to basics, and, for a team like this, that should be a good thing. Academy, n. A modern school where football is taught. From Ambrose Bierce's Devil's Dictionary. Deal or No Deal and incoherent views of "trade value"
Look at it this way: If the Broncos pay Marshall and hang onto him, one of two things happens: He either stays healthy and out of handcuffs and is an extremely productive player, or he ends up suspended or in court again, in which case, the Broncos don't get the value they should. If the Broncos trade Marshall, though, they also don't get the value they should. Period. So the only possible way to maximize what you get from him is to roll the dice, keep him around, and hope you get the best out of him. In any other scenario, the Broncos lose. The italicized conclusion does not follow from the premises, and largely contradicts #1, that they keep him and "he ends up suspended or in court again." The key issue is that there is something they "should" get. Should Marshall be "worth" more, based solely on his talent? Yes, but the fact that he isn't is due solely to himself; it is not something the Broncos have any control over. They must take their troubled receiver as they find him. Indeed, while value of a player is some estimate of their probable production, that value is a calculation their talent and capability multipled by their risk of injury, off the field trouble, discontent, etc. You don't produce if you're not on the field, and we've seen otherwise talented players be traded for peanuts or released because they weren't "worth" what they were being paid. See Terrell Owens. Trade or No Trade? The upshot is that SD's conclusion -- that the Broncos must keep Marshall -- doesn't follow, because it confuses "maximizing" expected gain with maximizing the possible gain, two very different things. This is a common cognitive defect, particularly after someone experiences a setback or dramatic loss in value, much like the Broncos just have as their star receiver has been in increasing amounts of legal trouble. The show Deal or No Deal provides a great example. Much has been written about the show from a behavioral economics perspective. I will assume people are familiar with the show's basic premise that someone selects a case, and then takes other cases off the board which whittles down the possibilities of what are in his case. Throughout the show, a "banker" offers the player a certain amount of money to walk away, based on what possible values remain in play. Let's say our contestant -- let's call him Sonny Chiba -- has four cases left, with possible values of $10, $100, $500, and $50,000. The case he just chose took $100,000 off the board, so he is reeling a bit and is no doubt upset about the money he just saw evaporate. The banker gives him a new offer: $16,000, significantly down from the previous one. Denver's Choice. No offense to SD (who I very much like as a blogger, and I am merely nitpicking out one random statement in a blog post), but his rationale seems to be that the Broncos must keep Marshall because there's a chance it might all work out and he'll be a pro-bowler. That is the same trap that our contestant fell into in our Deal or No Deal example. Now, this doesn't mean the Broncos must trade him either; we don't know the corresponding offers with as much certainty as Deal or No Deal, either. And he's right that the Broncos probably won't get a fantastic offer because of Marshall's off-the-field problems, but that's to be expected. If believed, SD's logic would be to expect other teams to have traded for Mike Vick or Plaxico simply because of their immense talents without regard to the probability of their spending all or part of the season in jail, or otherwise or caught up in the legal system. The upshot is that "trade value" should not be confused with the maximum possible upside. Yes, Marshall has big upside, but all the risks surrounding him bring that value down, just as it does for Plaxico, Pacman Jones, Vick, T.O., or even guys on the total straight and narrow who are an injury risk. Just because a player might be great, or has the potential to be great, does not necessarily make their trade value better than another player. There's a difference between upside and realistic expectation. What it means is that the Broncos -- or another team that might trade for Marshall -- must understand not only what he is capable of but what baggage and risks are attendant as well. In other words, if the Broncos get what they think is a good deal, they should take it. And if Marshall winds up making the pro-bowl elsewhere, then they can (or at least should) be able to safely say that they made the best decision they could under the information they had. Sonny Chiba could say the same thing if, after he took the banker's offer of $16,000, Howie Mandel opened his case to reveal $50,000. That's just how the game goes. It doesn't change the fact that his decision was undoubtedly the correct one. There's a couple variations in how the shallow is used. Typically, a shallow route is combined with some kind of ten to twelve yard square-in route behind it. The question is from which side does the square-in break from: is he coming from the same side as the shallow -- i.e. trailing him? Or is he crossing over the top? This matters because it makes a big difference between what kind of flow you're looking for from the linebackers and where the windows in the zone will be. The Airraid guys tend to have the two guys cross and head in opposite directions. the diagram below. (Image courtesy of Bruce Eien; check out more notes on their version here.) For clips of this version of the concept try here and here. It's a great concept: the shallow pulls the linebackers while the square-in -- aptly known in Airraid terminology as a "hunt route" because the receiver "hunts himself a good place to settle down" -- find the void between defenders. I am concerned in this post, however, with an older version of the shallow. This is the "drive" concept, made popular by Bill Walsh as a way to get his flanker or "Z" receiver (Jerry Rice, hello!) the ball running full speed across the formation. Secondarily, if they covered Rice there was usually a big window in which to throw the ball to the tight-end. Below is a diagram of how Walsh ran the play from several different sets, straight from an old 49ers playbook. First, a few features of Walsh's version. Keep in mind a very basic fact that many NFL announcers do not understand: The slant and the shallow are not the same play. On the slant, the receiver takes between two and four steps upfield (I prefer three, beginning with the outside foot back) and then a 45 degree break. The quarterback takes a three-step drop and delivers it quickly. The shallow, on the other hand, takes awhile to develop. The quarterback takes a full five-step drop (and sometimes seven, or five from shotgun) and waits for the receiver to at least cross the centerline. Again, it was Walsh that helped systematize these plays, though they preexisted him. Anyway, his "drive" route, as he called it, begins with the shallow. Walsh often motioned his flanker towards the formation to enable him to explode through all that man-traffic so he would hopefully emerge free and clear on the backside. If the defense was in was man-to-man -- especially loose man-to-man -- the cornerback usually had a hell of a time trying to catch up with the receiver. But if the defense did cover that route, the tight-end was responsible for finding the void in the zone. The final read was the runningback as an outlet. But, before getting to those routes, the quarterback always retained the option to throw deep to the corner route or the "go" route on the backside; typically this was the case if the defense was in man to man and he saw a matchup he liked. Note how Walsh sometimes had the corner route run by the halfback in the backfield -- think of Roger Craig or Ricky Watters with a linebacker assigned to him. Alternatively, sometimes the cornerback and near safety were so concerned with the flanker and tight-end that they collapsed down, leaving the runningback or slot man to break wide open on the corner. Nowadays, many modern teams send the runningback on a "wheel" route -- i.e. begin the route like you are running to the flat on a "shoot" and then turn and "wheel" it up the sideline. Below is a variant Bobby Petrino has used in the past at Louisville, the Pros, and now Arkansas. So where are we now with the play? There have been a few changes in how most teams use the route and concept, especially since now that so few teams base out of two-back sets. As a result, the shallow is seen more as a route for inside receivers than a way to throw it short to your flanker. Below is a diagram of one of the modern versions (as you can see, quite similar), explicated in rich detail in Dan Gonzalez's book, Concept Passing: Teaching the Modern Passing Game. Gonzalez calls his route concept "drag." So the basic route structure is the same as Walsh's drive. 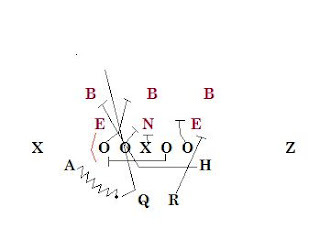 The major differences are that interior players are used, that the outside receiver to the trips side is given a post route to exploit a safety who might play the square-in too aggressively, and on the backside the X is a greater part of the play. The quarterback isn't always told to read the comeback, but if he does he keys the outside linebacker to that side. See the diagram below, the man circled in blue. If the linebacker drifts where he is or takes the shallow coming to him, the quarterback can drill the ball to the comeback on the outside. If the linebacker heads quickly to the flat to take away the comeback, the shallow route should come wide open in the void he has vacated. The rest of the play works just like Walsh's drive: either the shallow or the square-in should come open depending on who the linebackers pay attention to, and if neither is open the runningback should be open. Below is footage of the play, thanks to Dan Gonzalez and Mav (first clip), and Bruce Eien (second clip). Bruce's differs slightly but is similar enough to be grouped into the same family. The film by Eien, directly above, is basically a cross between the true, old school "drive" and the Mark Richt/Florida State version, which again is the same "drive" concept but applied to a more two-by-two setting. For more on Richt's version, check out Trojan Football Analysis. Below is a diagram and cutups of the concept as another comparison. As evidenced by my old post on how Mike Martz used the route, the shallow's usage is limited only by the imagination. It can be the primary route, the hot route, or a secondary route for the quarterback to come to late in his progression. It can be run by any receiver, and can be part of a main concept or used in some auxilliary way. But however it is run, it is still one of the best ways to get the ball to a playmaker -- speed in space -- and so long as teams keep spreading their formations, they will keep using the shallow cross. Bonus - Video below of Mike White, then head coach of Illinois, explaining the now-Airraid version of the shallow cross. His quarterback at the time was Jack Trudeau. After diagramming the play White shows the square-in or "hunt" going for a big touchdown against one of Bo Schembechler's Michigan teams. I've previously deliberated on the "smash" concept at length; it's one of the best passing plays, a staple of every modern passing game, and was in many ways one of the transition concepts from the dark ages to today's sophisticated passing attacks. The basic concept is a simple one: an outside receiver runs to about five yards and basically turns around, while an inside receiver runs to about ten yards and breaks for the corner. The idea is for the outside receiver to hold the cornerback shallow while the corner route breaks open behind him. See the diagram below. I had long remembered this play, but I was delighted when I saw that Every Day Should Be Saturday tracked down the famous use of the "smash" concept by Auburn (then coached by Terry Bowden) to beat Florida. The video below is self-explanatory; the smash concept could not be demonstrated more clearly. I spoke very briefly to Coach Richt later on during the day when he was taking questions from attendees in another room before he left. I asked him a follow up question about the plays somewhat declining effectiveness compared to the Florida State years. Coach Richt replied that he used to think it was easy to make the play work. However in reality and with the benefit of 20/20 hindsight it was also special players like Charlie Ward and Warrick Dunn that made it so effective in the past. Also he thought the best defense versus the play is a Cover 2 scheme which is now so common. This defensive alignment often makes the play essentially just a Hi / Low “Smash Route” type read to just half the field versus the flat defender. This adjustment can be accomplished either on the front side or back side with minor alterations to the play call. Still the Shallow Cross is a very effective play but not quite what it used to be in the past. Also Coach Richt conjectured that many defensive coordinators down South learned not to blitz the play (he wishes they would however) as that gave up many big gains and easy TD’s in the past. In the NFL as a whole, visiting teams average about 19 points with a [standard deviation] of 10 points while home teams average about 23 points with a SD of 10 points. But unlike basketball, football opponent scores are negatively correlated. This makes intuitive sense because the better one team does, the worse the other should do. . . .
Here’s why underdogs should play aggressive and risky gameplans. Take an example where one team is a 7-point favorite over its underdog opponent. Say the favorite would average 24 points and the underdog would average 17 points. With a [standard deviation] of 10 points for each team, the underdog upsets the favorite 31.5% of the time. . . . [I]f the underdog plays a more aggressive high-variance strategy, increasing its SD to 15 points, it would upset the favorite 35.3% of the time. . . . . So what does any of this mean in the real world? Simply put, to win more often underdogs should employ a high-variance strategy from the beginning of the game. It shouldn’t wait until the 4th quarter and become desperate. Go for it on 4th and short, run trick plays, throw deep, and blitz more often. Roll the dice from the get-go. Amen. One of the real insights of the article is the proof that variance is good of its own right, even if the "riskier" or higher variance strategy doesn't net the underdog any more expected points, the simple act of variance will net it more wins over time (though with the trade off being more blow-outs). This all comes back to your focal event . . . , or the instant where you realized the game had some kind of parasitic, infectious grip on you that no amount of treatment would undo. . . .
No injury time, no second chances: just a minute and change left on the clock bleeding because the rules dictated it and demanded you respond. Every football game dies one second at a time, bounded by a thousand rules, and played out by teams of fragile people working under pressure to be as good as they can possibly be under the circumstances. Its stricture gives it its drama, its limits force creativity, and its scarcities give it is masochistic cost/benefit payoff. More relevantly, football’s economy gives it emotional resonance. If you’re watching it, you watch it because you see a neatly packaged simulation of life itself–ruled, defined by a beginning and an end, and often chaotic in spite of all the rules–with two satisfying twists. First, an actual victor is declared, something very rare in life. Second, you know roughly when it’s going to end. Because of this football, for all its violence and terror, will never be as deeply terrifying as life itself. (Even when Terry Dean throws four interceptions in a single game.) Without the clock, without triple zeros set between the bounds of a field precisely 160 feet by 360 feet awaitig you, meaning is debased, and we’re not left staring at the death sentence spelled out in incandescent bulbs on the Florida Field scoreboard 15 years ago wondering what the hell just hit us. All of life is in these moments, captured and replayed for us every weekend, every fall. 4. EDSBS to CBS? In the wake of the block-buster (for the sports blogosphere at least) deal between NBC and Pro Football Talk, might CBS Sports be interested in the blog run by a good Mr. Swindle just mentioned? 5. Maybe, Definitely; Brett Favre is coming back. So says Shutdown Corner after watching John Madden's adopted son on Joe Buck's new show. (Which had a rather interesting opening episode, featuring Artie Lange.) I don't have Favre rated all that highly, but I suppose from the Vikes' perspective the question is merely, "Is he better than Sage Rosenfels and Tarvaris Jackson?" 6. Lane Kiffin death-watch. The verdict from around the web is increasingly in, and it is that Lane Kiffin must be insane and there is no way the Volunteers can succeed, and that he cannot be credited with knowing what he is doing. For some of the best weigh-ins on this, see Dawg Sports, mgoblog, and Senator "I just don't get it" Blutarsky. I am not sure if I completely agree, but I will say that, after watching the man commit NCAA infractions on national television in front of a live film crew, I find it difficult to imagine what he does think he is doing, exactly. And, surprisingly enough, he is beginning to make Al Davis look smart for firing him. ... But ... but . . . his coaching staff is so credentialed. How can Jim Chaney, Orgeron, and Monte Kiffin not know about this? Not have an opinion? Why would they accept this job if they didn't think this was going to work? Why can't they, apart from their supreme leader, make it work? Maybe Lane will turn it around, maybe he'll be proved a genius. But his tenure at Tennessee might be a study in management, as much as anything else. If a sort of CEO-style figurehead head coach had Kiffin's staff -- like Joe Paterno, for example -- I think everyone would have to assume that it was all going to work. There might be benefit in Kiffin's just getting out of the way. But that's not his style, and it is ambiguous right now what exactly he's bringing to the table. Maybe the excitement and all that is enough, though. Time will tell. Very bizarre though. But so long as they have that staff, you can't count them out. 7. Tweetin'. Smart Football is on twitter now. Sign up and check it out. The internet has sparked an unheaval in media's traditional order: legendary newspapers have slashed staffs or gone out of business; magazines I used to read are now defunct; and my daily digest is composed not of one trusty periodical but instead largely of an instantaneous compendium of smart, expert, piratical, and (mostly) independent bloggers. The old media is hurting: how to keep up? how to stay relevant? Magazines, which have been hit as hard as anything else, are underdoing massive change; Newsweek and Time both want to be the Economist. Sports media is its own strange animal. It begins (and all too often also ends) with ESPN, the behemoth everyone must reckon with. No matter how independent a blogger or fan might think themselves, their sports they consume has at some point passed through ESPN's loud, garish filters. But with the internet there are clearly more choices, though it seems the local beat writer has been hit harder than ESPN the megalodon. But new media is clearly on the rise, and the heat between the two sides is often fun to watch: I admit to experiencing a frisson whenever a sports blogger destroys a particularly inept pundit. The pundits naturally do not take kindly to this, because, apart from exposing the weakness of their analyses, they also are helping to drive them out of business. Yet many bloggers would like what the old media types have, or at least had until recently: a stable situation enabling them to write about sports for a living. If anyone should be allowed that luxury (I do not have such grand hopes for my modest site), it should be many of these bloggers. This past weekend New York City played host to the Blogs With Balls conference. Brian Cook attended and cogently wrote about the conference, highlighting the incoherence that (a) somewhat blighted its good intentions, yet (b) could only be expected when old and new media alike were thrown together to talk about whatever the hell it is they are all doing and where this ship is headed. I can safely say that I am happy with my strange little corner of the internet, though I just wish I had (read: would make) more time to post more frequently and in greater depth about the subjects I really enjoy. But the question is: in all this heat between new and old media, is there any light? I was a resistant blogger. Like many who start blogs, I had semi-delusions of grandeur in starting Smart Football (and its predecessor the Chalk & Talk) in that I told myself, "Oh, it's not really a blog" -- nevermind that it is hosted by something called "Blogger." That attitude manifested itself in the paucity of updates combined with each post's length. (It is still the case that I post less frequently but with longer articles than other blogs, though far different in degree from my earlier days.) Over time however I've really grown to embrace the blog format, including diagrams, pictures, and videos, which are obviously impossible in print, as well as, well, the blog movement: Smart Football is a blog, and damn proud to be a (small) part of the community. This flows from embracing the paradigm shift in media and, specifically, in sports media. Blogs are here to stay, and their immediacy and interactivity give them huge advantages in certain respects. Yet old media can co-opt the technology (and even sometimes the people); ESPN, Sports Illustrated, and many others can get themselves a potent web presence. But what the blogosphere and the internet generally have done is democratized analysis. J-Dub of Blue Gray Sky discussed some of the mechanics of the sports punditocracy before this massive change, but the short answer is that sports journalism, for several decades, was a tournament where the few coveted spots went to the willing and the lucky, while everyone else went off to some other area of employment. Now, those with day jobs can contribute, and the punditocracy is more meritocratic than ever. So there are certain things that the blogosphere is simply better at delivering than than the old guard, and that includes both analysis and humor -- two rather huge categories. (I tend to focus on one versus the other. You be the judge.) Beat reporting and real journalism will never die -- Deadspin's famous motto, "Sports News without access, favor, or discretion" is cute but it has its limits -- yet the future of the old-school salaried pundit who chimes in with periodic nuggets of wisdom is in peril; he is in peril because he's been exposed as not very good. There are many examples. Humans can only read so much stuff in a given day, and as a result there's a substitution effect: a small difference in quality leads to vastly different results -- i.e. a complete swapping out of the inferior good for the superior one even if the difference between them is only slight. It is a little like selecting a starting quarterback: they might be similar, but you can pretty much only have one guy, and to the victor go the spoils. The practical upshot is: why read Stewart Mandel so long as Brian Cook and Matt Hinton retain the ability to type? (Hint: There is not one, unless you count masochism.) My comparatively low-traffic site is not a great example, but I do know that my driving philosophy is to write the kind of articles that I would like to read but the mainstream media seems incapable of producing. This is really the same phenomenon that is gutting newspapers around the country. There are some bitter, sad stories about good journalists who have succumbed to the pressures imposed, in part, by new media, including the Baltimore Sun laying off reporters during a game they were covering. But there's really no way around this. Old media had an incredible bottleneck, and one economic effect of bottlenecks is that they push up wages; when the bottleneck is cleared or, maybe more apt when describing the internet, is transformed into a fire hose, the wages of the old style "pundits" are driven down, way, way down. The result is that old media types like Mandel can't resist the temptation (admittedly, his column is a few years old) of deriding bloggers by saying banal things like: "I'm guessing you'd have a better chance getting these guys to actually shave and shower on consecutive days than participate in any idea that originated from me." And it's understandable why: many bloggers are better than him at his job and their very existence is driving him and his kind out of business (though apparently not quickly enough). One reason, covered above, is the replacement value of clicking on one website (say, Dr Saturday, where the analysis will be timely, exceptionally well-written, and sharp), or another (SI.com where you get Mandel and his lame mailbag). But the other is that nobody, or at least only a few winners, will be able to make some kind of steady living solely by churning out football analysis. Now I don't want to get into what good wages might be, and I'm aware of several bloggers who are doing quite well, but the days of every city having several sports columnists and big newspapers and networks having bloated staffs of salaried sports guys is over; the part-time on-the-side blogger is here to stay. So when the Mandel-types snipe at bloggers and (on the rare occasion!) that bloggers snipe back at the big media, there's an element of class warfare going on, but it is increasingly irrelevant class warfare because we're at a new world. 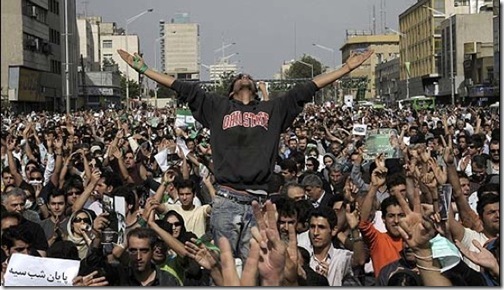 All this seems both more, and less, salient considering it is blogs and twitter that is providing superior coverage of what is going on in Iran as we speak. It is all connected. This is why the Blogs With balls idea was a good one, at least in theory: there needs to be some integration. And maybe we're seeing it: Pro Football Talk has partnered with NBC Sports. It's maybe the biggest deal in the "15-year history of online sports -- and the 5-year history of sports blogs." A few years ago (long, long ago in 2005) I read an essay by Richard Posner where he talked about the decline of old media in the face of new technology, and particularly blogs. He took a lot of heat for it, but, while it now reads a bit dated, the overarching message seems rather prescient; old media is hurting right now. This is not an unmitigated good, and no doubt blogs and other internet media -- much of it without any access or even a desire for it -- can only complement traditional reporting. But the Mandels, Dennis Dodds, and, more unfortunately, many regional sports columnists paid to opine on the usual stuff, are an endangered species, and the net result of that is more immediate, more fun, and just plain better analysis from bloggers. So my advice to all is to do what it took me a few years to do: Stop Worrying and Learn to Love the Blog. [A]re the days of the option pitch, jet sweep and jump pass coming to an end in Gainesville? Already we know that Tim Tebow and [back-up quarterback] John Brantley spent countless hours this spring working on hand-offs and drop-backs from under center during spring practice. And that the coaches spent most of the spring identifying players who could play fullback as Gators tinkered with an “I-formation” offense. And that Brantley, the heir apparent to Tebow, does not have the skill set to run the spread-option the same way Tebow does (not a knock on Brantley, just stating the obvious that Tebow is a unique physical specimen). . . . Apparently Florida’s coaching staff (i.e. quarterbacks coach Scot Loeffler) is downplaying the whole spread-option thing, and telling recruits that a more pro-style offense is being installed. From [ESPN's Bruce] Feldman: "The Gators coaches told [a recruit] they’re going to more of a pro-style offense, because NFL teams don’t run the spread, which [the recruit] says was good to hear since he’s more of a pro-style guy himself." It’s an interesting turn of events for the Gators and Meyer, who are trying to fight the perception that Florida skill players – mostly quarterbacks and receivers – don’t succeed in the NFL because they don’t get the proper training in college. A few thoughts. First, this is overblown insofar as the idea is that, once Tebow leaves, all the spread stuff goes out the window. It's unlikely that a coach like Meyer, who has run the spread for a decade on his way to an undefeated season and two national championships, will suddenly chuck what he has done in favor of being totally"pro-style." That said, there might be a hint -- but little more than that -- of truth to this. New quarterback coach Scott Loeffler is more of a pro-style guy, it is true. He coached for a long time at Michigan, which was definitely more on the "pro" side of the spectrum, and he of course spent some time in the NFL, most recently with the Detroit Lions. The Gators might be looking to add a few of these NFL looks, possibly as much to take advantage of their runningbacks as with their quarterbacks. Indeed, assuming the reports that the Gators used more under-center and traditional set stuff during the spring is true, I chalk most of that up to trying new things with new coaches and a veteran group that just came off a national championship; Tebow knows how to run the spread stuff so why not work on some wrinkles? The whole SEC will spend the offseason working on ways to knock Florida off. Meyer knows he has to stay ahead of the competition. But, more importantly, this anti-spread angle for recruiting is unfortunate but real. High school or even NFL head coaches might bristle at the idea that you would do anything but what absolutely gives you the best chance to win on the field (and for players it is my way or the highway), the reality in big time college football is that Meyer must compete against Southern Cal, Ohio State, Miami, and others for top-flight recruits. And most of those guys expect to the go to the NFL. There is no doubt that the most recent NFL Draft felt at times like a giant negative ad campaign against the spread, complete with Mel Kiper chiming in to talk about Tebow's bright NFL future as a tight-end or H-back. Contrast that with the glowing praise the talking heads -- and even NFL coaches -- heaped on Matt Stafford and Mark Sanchez as being "NFL ready" because of their "pro-style" college systems. All this adds up to recruits actually believing this stuff; perception becomes reality. It also points to the idea that Meyer might be adding some pro-style for "flavor" and recruiting purposes. A little could do him a lot of good: he would have more of a recruiting pitch; he could possibly dispel some of the "he can't take a snap from under center" talk plaguing Tebow to help him be a better draft pick, and those two things together could be enough for him to explain away the negative comments about the spread without actually, in fact, giving it up. Meyer's a spread guy to the core, but he also is pretty shrewd. It's all part of college football. UPDATE: Spencer Hall at the Sporting Blog chimes in, announcing that the spread is not dead, though Meyer might be a cyborg. And a reader who spent some time with Florida's staff this spring says he agrees that it is partially as a wrinkle and also as a recruiting ploy.